I’ve been feeling depressed again lately. I am hoping somebody gets something out of this. 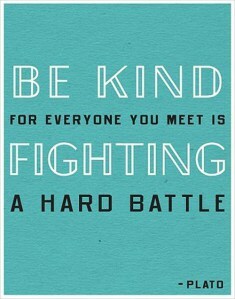 In the past few months, I’ve seen the quote “Be kind for everyone you meet is fighting a hard battle” all over the place. If my Facebook newsfeed is any indication, the majority of my friends and the pages I like feel strongly about this topic. It would be lovely to think that the world suddenly got more empathetic and understanding and was suddenly inspired to live according to these words attributed to Plato, but somehow I doubt that. It’s just something neat to put on their wall to grab a few likes. For me, it’s different – because I fight the hard battle known as depression.